Interacting with people by telling them a story made of music, behind two turntables, has always been his distinctive feature. Big passion, re ned style and maniacal attention for every detail, are the values that have always characterized Luca Donzelli, even when, only twenty years old, he made his rst steps in the world of clubbing. Thanks to his engaging sets and to the originality of his ideas, he succeeded to make himself appreciate in the tuscany’s music scenary since he was really young. In the following years he became resident dj of some local clubs and, thanks to his dedication to job, “the bet” turned into a real talent! The next step came when he made music production has his workhorse. In fact, are tracks like “Bottle Of Truth”, “ Danzen Appeal”, “Burn That Gasoline”,and “Daemonesque” that promote him worldwide, bringing him shortly to cooperate with more and more important labels, as Titbit Music or Wow! Recordings”. Here started a big collaboration with Mar-t,Wow label’s chief, and his crew. 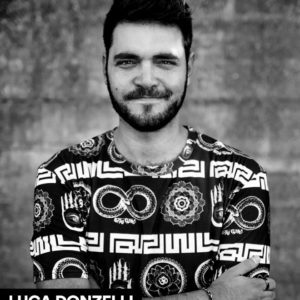 A high cooperation that brings Luca, with his amazing studio’s ideas, to big important international music stages like the Sonar Week in Barcelona. His fascinating style behind the consolle and the success of his music works, played and supported by the best djs in the world, make us understand that these are just a few of the big surprises that this talented artist is keeping for the international electronic scenary.